Melbourne public transport is a convenient way to navigate and travel Melbourne. It is a great way to get around. You have a choice between trams, trains and busses. Its integrated ticketing system makes it easy to hop on and off, and join different lines and modes of transport, all on the same ticket. Travel on Melbourne public transport is cheap. If you are staying for a while get a weekly ticket. A weekly MetCard for Zone 1, which covers the city and surrounding suburbs, is only around $30. A same price alternative is a MetCard with 10 x 2 hour trips. Use that if you don’t travel every day. If you validate this card twice in the same day, it will give you travel for the rest of the day. MetCards are available in many corner-shops, in 711 stores and newsagents. Check that your destination lies within zone 1. If it’s further out you will need to get a zone 1&2 ticket. You can also get daily tickets for around $7 and two hour tickets for around $4 on trams, busses or at train stations. You will need coins for machines if you buy them on a tram. Melbourne Metlink is the Melbourne public transport operator. On their website you can enter your origin and destination and it comes up with the best connections. Melbourne train timetables and Melbourne tram timetables are also available on this site. MetLink also has a shop, the MetShop, located at the Melbourne Town Hall on the corner of Swanston and Little Collins Streets. You can also get MetCards there. Furthermore, they have other special tickets, student passes, timetables, brochures, maps and travel merchandise. Meltrip is an alternative non-government website with can often offer better choices on trip selections and transport information. It has a useful destinations page as well as a city travel section that gives you information of how to get to major attractions, shopping centres, airports, and sporting venues. There is a free City Circle tourist tram that travels around the city. It's a great Melbourne city guide as it announces inner-city attractions on he way. Hop on and off at any stop. There is also a free Melbourne City Tourist shuttle. 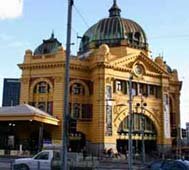 It is a hop-on, hop-off service with stops at the Arts Centre and Federation Square, then travels to the Melbourne Museum, Lygon Street, the University of Melbourne and onto the Queen Victoria Markets. From there it continues to Southbank, to the Sports and Entertainment Precinct, the Shrine and the Royal Botanic Gardens. Melbourne is famous for its trams. The image of a Melbourne tram is an integral part of the distinctive Melbourne atmosphere and flair. There are old ones that operate on the city circle and as tramcar restaurants, and the range continues right through to the latest modern comfortable models. Many Melburnians, particularly those living close to the inner city, love their tams. They are an integral of people's lives. Melbourne public transport has one of the world's most extensive tram networks that extends into the suburbs from the city in a radial fashion. Trams travel frequently and you have the opportunity to hop on and off at any of the many stops. Its disadvantage is that it can be slow. The Melbourne train network consists of 16 suburban railway lines. Trains are great for longer trips out into the suburbs and faster. Find out what Zone your destination is in, so you can get the right ticket. As the trains come into the city they drive around the City Loop. For a non-regular train traveller, it can be confusing, which way they will be going around the loop. If you hopped on at ‘wrong’ end you will be taken around the loop before heading out in your desired direction – check first if time is an issue. City Loop stations are: Finders Street Station, Southern Cross Station (Spencer Street), Flagstaff Station, Melbourne Central Station and Parliament Station. The Melbourne public transport bus network comprises approximately 300 routes. They form the connecting links between radial network of trams and trains and provide travel between Melbourne suburbs. Taxis in Melbourne are comfortable and numerous, - and always there as an alternative when you don’t want to wait for a train, tram or bus – or missed the last one. My son is impressed by the Melbourne taxis as they look like the yellow ones in New York.